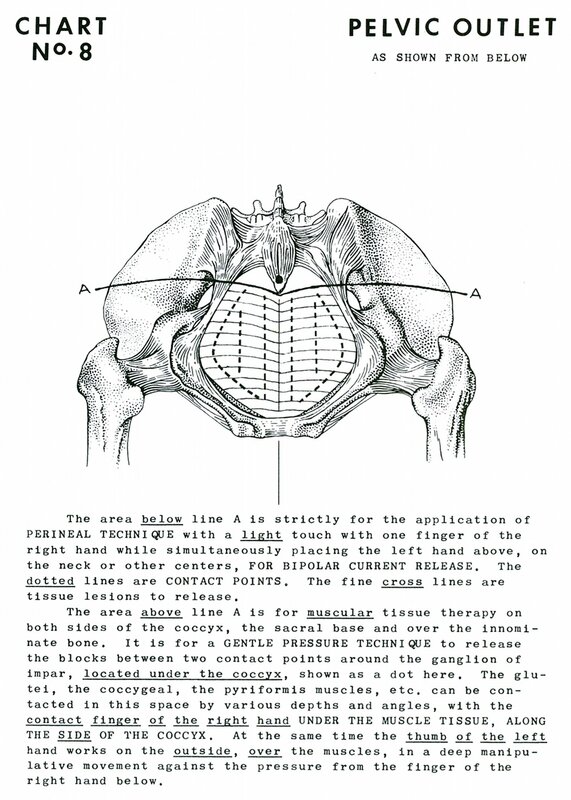 The area below line A is strictly for the application of perineal technique [see Book 2, Charts 30 and 31] with a light touch with one finger of the right hand while simultaneously placing the left hand above, on the neck or other centers, for bipolar current release. The dotted lines are contact points. The fine cross lines are tissue lesions to release. The area above line A is for muscular tissue therapy on both sides of the coccyx, the sacral base and over the innominate [hip] bone. 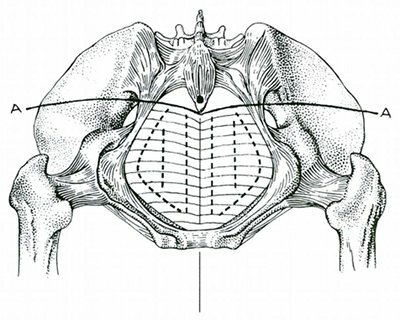 It is for a gentle pressure technique to release the blocks between two contact points around the ganglion of impar, located under the coccyx, shown as a dot here. The glutei, the coccygeal, the pyriformis [piriformis] muscles, etc. 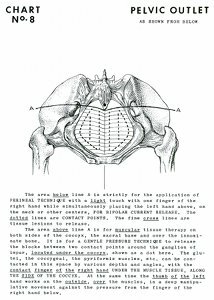 can be contacted in this space by various depths and angles, with the contact finger of the right hand under the muscle tissue, along the side of the coccyx. At the same time the thumb of the left hand works on the outside, over the muscles, in a deep manipulative movement against the pressure from the finger of the right hand below. Book 1, "Explanation of Chart No. 8"